On the Western Line to Parramatta express trains rumble past what used to be the central core of Australia’s rail manufacturing industry. Now an arts venue, conference space and market site, Carriageworks on March 23 played host to 500 arts professionals who debated the future of the arts in NSW. They had been assembled in the old Eveleigh rail yards by Arts Minister Don Harwin and a priority item on the agenda was engagement with Western Sydney as it transitions from the home of manufacturing in Sydney to a cultural region of equivalence to central Sydney. Western Sydney is designated by the NSW government as a priority growth area, yet the place of the arts within this rapid development remains an unanswered question. However, these recent funding announcements by Create NSW, point to the direction that these discussions will take as they look to focus on the interaction between artists and property owners, a conversation that local and state governments aim to broker. For Western Sydney-based artist Rebecca Gallo, the funding from Create NSW are a sign of support for the arts, in particular “grassroots artist run initiatives happening in Western Sydney.” Gallo, whose practice ranges from sculpture to installation and performance, is working with five collaborators to establish an artist run initiative (ARI) in the Parramatta CBD. If successful, the ARI will be the only gallery of its kind between the Blue Mountains and Summer Hill. Gallo is working alongside artists Kalanjay Dhir, Alex Tanazefti, Sasanki Tennakoon, Justine Youssef and Tian Zhang, all of whom either live and work in Western Sydney or have grown up in the area. By placing an ARI in the heart of Western Sydney, they hope to centre Parramatta and Western Sydney as a place of cultural and artistic production. “We'll probably be looking for work from established Western Sydney artists and bring in younger or early career artists who haven't had many opportunities to show their work,” said Gallo. Opportunities for Western Sydney artists have been limited by a lack of government funding and support. Western Sydney, home to one in ten Australians, receives only one cent in every Commonwealth Arts Funding dollar, according to a 2015 Deloitte report. 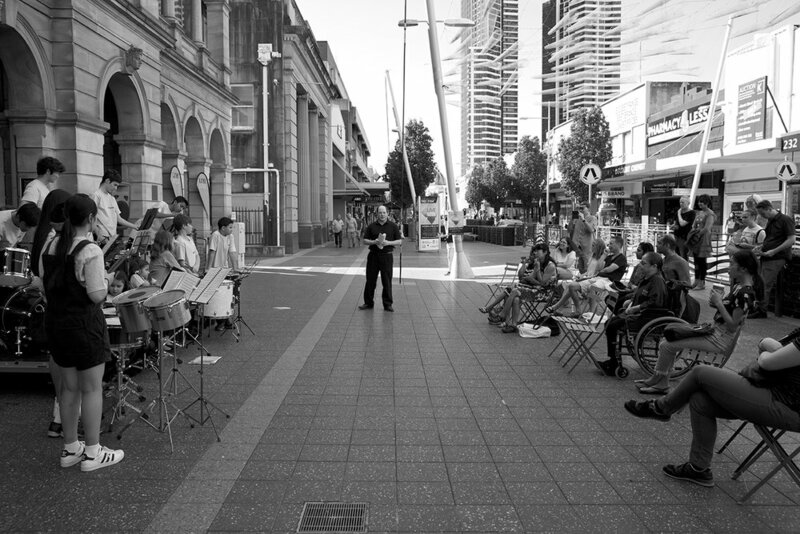 Within New South Wales, Western Sydney accounts for thirty percent of the population, but only receives five and a half per cent of NSW Government Cultural Arts Funding. Harwin’s recent funding announcement aims to go some way to redressing this imbalance. While Harwin’s one million dollars might seem like a lot of money, on its own it cannot support the diversity of artists working across Western Sydney, whose numbers will only continue to grow. Natalie Wadwell is one of those artists and is seeking to promote alternative models of support for the arts. Introducing the concept of the artist as entrepreneur, Wadwell reflected that “I think we're beyond the time when we need to be knocking on director's doors saying ‘hey, you need to create opportunities for local artists.’ I think we need to actually work together as a collective and pool together resources and coordinate better to activate other pockets within alternative spaces.” This approach has seen Wadwell work with LendLease and other organisations through the Stepping Up Macarthur program from 2013 to 2015. For Zachariou, moving beyond pop-up exhibitions enables the development of a sustainable artistic environment. For as much as alternative models of exhibiting art can be discussed, the core issue in Sydney is the cost of real estate. Alicia Talbot, Senior Strategic Project Leader – City Identity, Experience and Engagement at the City of Parramatta, knows what kinds of resources are available and is looking at what this means for the future of the arts. “Because of the pressures in Sydney in terms of real estate and resources it means that new conversations around partnerships … begin to open up,” explained Talbot. As outlined in the Greater Sydney Commission’s plan, by 2056 Sydney will be comprised of three CBDs. The current harbour CBD, a river CBD in Parramatta and a parkland CBD centred on Badgerys Creek Airport. To realise this vision, over the next few decades Parramatta will be characterised by significant commercial and residential development. The place of the arts and cultural institutions within this rapid development remains an open question, however it is one that Gallo and her collaborators are intent on asking. Marshall supported this observation, noting that “there is a huge need for the Western Sydney arts ecology to evolve even further to include larger and smaller government funded galleries. It would be even more interesting with the evolving economy to see a thriving commercial gallery scene.” While central Sydney already has many commercial, state and artist run galleries, there is no permanent exhibition space in Parramatta for visual art. To address this gap, in 2017 Parramatta Council released its cultural plan for 2017 to 2022. Entitled Culture and Our City, the plan identifies a need for a permanent exhibition space and the value of supporting smaller initiatives such as ARIs. This is not matched with an immediate commitment to satisfy the need. The numerous action items within the cultural plan are split into current, short, medium and long term time frames; the research and the development of a feasibility study for a gallery, as well as the provision of seed funding for ARIs are grouped in the medium and long term time frames. Currently, the City of Parramatta offers grants including a $20 000 Creative Fellowship Fund and a $60 000 Creative Project Leveraging fund, providing up to $20 000 per project in matched funding. Another emerging model of council support for creative initiatives are subsidised rents, however in Parramatta this model is difficult to implement. As Talbot, author of the cultural plan notes, property is at a premium in Parramatta. Parramatta’s CBD has one of the fastest growing markets for commercial property in Australia, with rents growing at 17 percent over 2017 and a vacancy rate of three percent. This not only puts pressure on creative organisations; social infrastructure such as community centres, libraries and childcare centres are also impacted by the same trends. For Talbot, who prior to working for Parramatta Council was the Artistic Director of Urban Theatre Projects in Bankstown and is a practicing Western Sydney-based artist herself, this means looking to different models of support. Some outside observers, however, remain sceptical. Wadwell has seen numerous cultural plans come and go particularly in her local government area of Campbelltown. What happens to the arts in Western Sydney over the next few decades will be an indicator of what is likely to happen to the rest of New South Wales. Western Sydney will be the focus of massive residential and commercial development and the quality of the physical and social infrastructure that goes along with it remains to be seen. Church Street, the main commercial artery in Parramatta, runs between two churches; St John’s Anglican Church in Parramatta Square and St Andrew’s Cathedral. In between are local and chain restaurants, two university branch campuses and perhaps, Sydney’s newest ARI. Central to Gallo and her fellow artists’ proposal is the impulse to put the arts front and centre in Western Sydney. “We want it to be something that you can see from the street and be curious about and come in and have a look around,” explains Gallo. Part of this accessible vision for the gallery involves changing the ARI formula. Unlike other ARIs which charge artists to show their work, Gallo hopes that in future the gallery will be able to pay artists a fee, allowing for the exhibition of the work of artists unburdened by the economic or social barriers which have kept Western Sydney artists out of the city-based galleries and institutions. With impending announcements of the nature of new institutions like the branch of the Museum of Arts and Applied Sciences (MAAS) which will be located in Parramatta, the success of these initiatives will depend on the kind of community involvement that they incorporate, something that Wadwell is critical of.